Although I haven’t seen or read it, just the fact that Matthew Greene was able to get a Mormon themed play up in major a New York fringe festival is nothing to sniff at. I’ve read both positive and negative reviews for #MormonInChief, but I admire Matthew (who was in BYU’s WDA Workshop with me several years ago) for really jumping into the New York theater scene and progressing the cause of Mormon Drama. 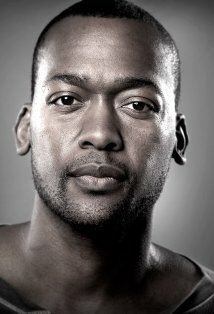 He’s also got an upcoming play coming soon to Plan-B Theatre Company in Salt Lake City called Adam and Steve and the Empty Sea. Matthew is getting some real traction in his career as a dramatic writer and I believe it’s well deserved. Since I’m going with “favorite,” instead of “best” novels, I would say that Dispirited was the most enjoyable novel I read this year. I had a blast reading it and could hardly put it down. I really hope that Luisa keeps writing, for I’m anxious to see what she comes up with next. I thought this novel, although perhaps not perfect by some people’s standards, had a strong concept, interesting characters, and an engaging, mood inducing writing style. It was a very solid novel and my personal favorite from this year. Now some may be surprised that I’m putting James here, since I did give him a pretty hard time in my review of The Five Books of Jesus, not to mention I’m still smarting from his own negative review of the Utah production of my play A Roof Overhead. But let’s be honest here, despite my hang ups with the Mary/Martha story in the novel (my main complaint), Five Books of Jesus was brilliant and beautiful. If I were to go with a “best” theme, instead of a “favorite” theme, Five Books of Jesus would have won hands down. It’s simply a compelling, lyrical, powerfully written, memorable novel, and there’s no denying that, despite my (somewhat personal) complaints. It will stick with me (both my positive and negative reactions to it) in ways that many, many novels (Mormon or non-Mormon) simply never won’t… and that’s a sign of masterful writing. 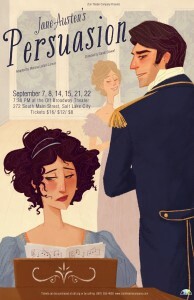 James has also shown a uniquely strong, tenacious commitment to the Mormons Arts world with his contests, essays, theatre groups, and efforts to organize the LDS literary community. If we were truly in a Mormon Renaissance, I wouldn’t consider him our Langston Hughes or Zora Neale Hurston, but I would definitely consider him our W.E.B. DuBois because of the communal vision and organization he is constantly trying to apply to all of our work as a whole. The fact that he’s not afraid to spar a bit with me is also a personal plus, as it sharpens both of our senses and arguments. And although people took umbrage with me calling The Five Books of Jesus a “marred” masterpiece, they seemed to miss the fact that I did, after all, call it a masterpiece. I don’t throw around terms like that, “skilled story teller,” and “master writer” idly. James is one of the best writers that we have as a Mormon community and I will be one of the first people ready to proclaim that. 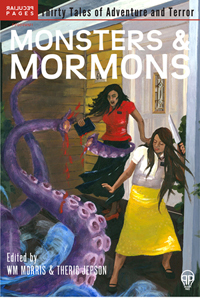 I bought three Mormon Anthologies this year, Fires in the Pasture, Monsters and Mormons, and Dispensation. As much as I’m enjoying the other two (although I haven’t gotten far with Fires in the Pasture yet), my experience with Dispensation was deep and moving. Although I didn’t engage with all of the stories, most of them had me hooked and fervently thinking, and all of them showed some major writing chops on one level or another. Seriously, I was impressed with the overall stellar quality of these stories. I still reflect on some of them from time to time and I believe they show a wide range and sampling of some of the best writers we have in Mormonism, as well as the depth and breadth we can go to in our worldview, beliefs and communal contribution. This one is a tie. Although Monsters and Mormons didn’t top Dispensation in its overall impact on my life this year, despite these two stories being “genre” fiction, they’re good examples that writing any genre can show great skill, thoughtfulness, philosophy, history, engaging characters and compelling themes and narrative. It doesn’t matter if they have ghosts, skin walkers, or Porter Rockwell fighting lake monsters… these were stories that fascinated and moved me. I would also like to note that Mary Clyde’s “Jumping” in Dispensation was a close runner-up in my mind… that one was deeply moving for me. A three way tie would have just seemed to be a little much. One of my “black and Mormon” (a supposed racial/religious oxymoron which the media seemed mystified by this year) friends Danor Gerald spearheaded this music video with the help of “The Mason Dixon Band” (you may know them better as Ryan Shupe and the Rubber Band) and Mormon film director Ryan Little. They satirized the conundrum which many Evangelicals faced this year in facing a choice between a Mormon conservative and a black liberal for president… to pretty hilarious (and somewhat shocking) results (make sure to watch the video until the end). A great piece of satire about the Evangelical response to the “Mormon Moment,” made all the better since Danor would be the subject of both of his protagonist’s great prejudices… anti-Mormonism and racism. And, yes, Danor also was a Texan, so this is a culture he knows intimately from the inside. Another tie. Jaclyn Hales really impressed me in two works this year. Her role in the film Unicorn City was all the more impressive since she gave a very vulnerable and honest (yet still funny) performance in a film that was meant as a broad comedy (she really outshines every one else around her in that film, as competent as they were). Jaclyn also played the lead in the new, multi-media version of my play Rings of the Tree earlier this year. I have rarely seen some one pull off one of my characters in quite the wonderful and vulnerable way she did. She literally expresses her soul in her acting. Ever since I’ve known Jaclyn, she continually impresses me with her grace, vulnerability, heart, and talent. Rachel Baird is an actress I hold in no less esteem. Her work in the performances of both of my one acts this year “The Death of Eurydice” and “Jinn” was top notch, as her acting for my plays has always been (you can see her in recordings of both of those shows here and here… in the second link Rachel is the one who comes later in the pseudo-Muslim garb in “Jinn”). There’s few people I trust as much with my own material as I do Rachel, as her artistic and soulful instincts certainly resonate with my authorial intent. She’s an actress that I constantly keep going back to, and the fact that she recently chose to serve the Lord on a mission for the Church makes me admire her even more. I purposely sought out Seth for the Arizona based, Binary Theatre production of my play A Roof Overhead to play the role of the Mormon, history focused Joel. I had seen Seth in a few productions by ASU student theatre groups and I was stunned by the talent, emotional range and dynamic intensity I saw. The fact that he was also one of the few fellow Mormons in ASU’s Theatre Department made him all the more a must have for me for this particular production. And Seth did not disappoint. He consistently got lots of laughs in his humorous bits, but more importantly he gave a nuanced and intense take on the serious side of Joel (and the characters in the script pointedly refer to how “serious” Joel is. “So serious! So sober! Our little Eeyore…” his sister Abish in the play says). Curiously, the wonderful Scott Hales (who I’ll mention later) gave specific critique to Seth in his review of A Roof Overhead, in part due to his “serious” performance. That may be in part because of the nature of the recording Scott saw, available on You Tube… it’s not the most intimate recording… and it was also a matinee performace, which are infamous for small, quiet, non-laughing audiences. Scott also had in mind the first actor he saw play in the Utah production who, though flawed, Scott liked his quirky, funny interpretation of the character. Ironically, most people who gave me feedback on the Utah production pointed out that the actor who played Joel was particularly disappointing and the weak link in the production for them (and from what I’ve understood from the cast, they didn’t have the warm, fuzzy interaction with each other that Scott supposed–apparently there were some very real personality conflicts), while the almost universal feedback I got on Seth’s performance of Joel in the Arizona production was hugely positive. He seemed to be a very particular favorite of most of the audience members I talked to. Again, this discrepency may be due to the matinee performance of the recording that Scott saw and how it impacted the energy of the show, or perhaps to Scott’s prior expectations that were set up by the previous actor. Either way, I certainly don’t agree with Scott’s assessment of Seth in general (although there are other things I definitely agree with in his critique). From the perspective of a director and a playwright who worked very closely with him, Seth was one of the most giving, talented, vulnerable and reliable actors I have ever worked with. The whole cast, in fact (despite the impression Scott had in his review), were a tight, close and passionate group of friends who were dedicated to the work and felt very connected to it, to me, and to each other. I’ve rarely had such a personal connection to a cast as I had with this beautiful group, with a few notable exceptions (my beautiful experience with my Fading Flower cast comes to mind) . The fact that the Arizona cast were mainly ASU undergraduates who were still learning may have effected some of performances (although, again, I was particularly proud and fond of this beautiful group), but I didn’t find any lack in Seth at all. Seth is definitely in my top tier of actors that I want to work with again. Okay, I broke down and did a three way tie, after all. The artwork of the two daughters of famed Mormon fantasy artist James Christensen bears a familial resemblance (especially in sharing their father’s sense of whimsy), but both have their own distinctive traits and qualities that make their work uniquely their own. I’m a great admirer of their father and his work, but Cassandra Barney and Emily McPhie have more than proven their own weight in gold to me (maybe even surpassing their father on my all time favorites list?). I love whimsy and these two great sister-artists have whimsy in spades! Which puts the solidly in my favorites column. (Also, for your gee-whiz collection, Cassandra has been featured in the “I’m a Mormon” commercials). And then there’s J. Kirk Richards, who’s simply been a given favorite for me for a lot of years. Ever since I saw his Cherubim and a Flaming Sword in his parent’s living room after my mission (I’ve been friends with two of his sisters Angelyn and Melanie since high school), I’ve been hooked. 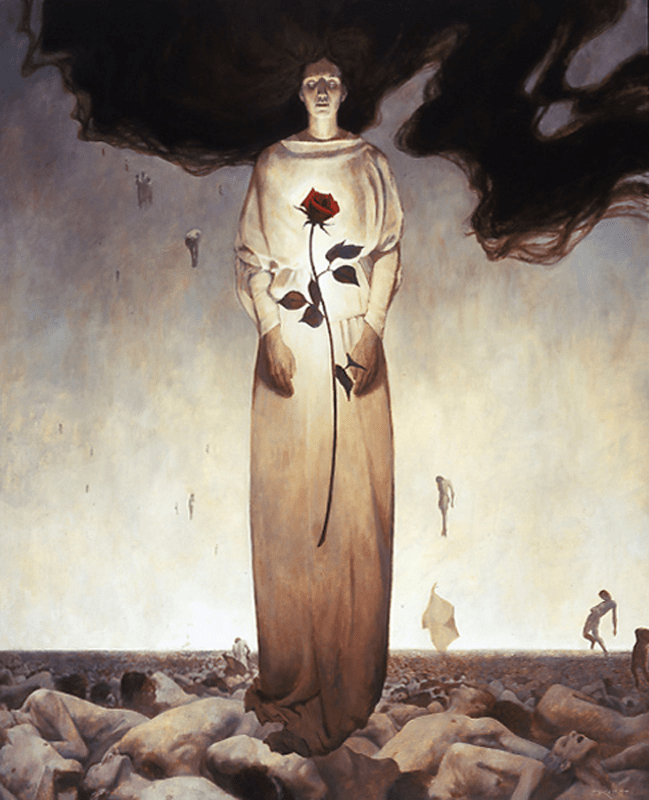 His work is top on my list to get large prints of when I can actually more afford spending large amounts of money on Mormon artwork someday (oh, please, let that day come!). Kirk’s emotional, evocative, sometimes almost supernatural take on religion, Christ, and life always has an impact on me, whether it’s one of his impressionistic pieces, or whether it has a more realistic bent. Either way, Kirk, as well as Cassandra and Emily will be on the top of my pull list, if I can ever afford the more large and fancy version of their work! Also, all three of these people also happen to be darned good people of integrity, love, and kindness… even to fawning fans like me! Yet it is true that this year particularly has curiously been my time to become aware (and a huge fan) of various Mormon Musicians, a number of them making an impact on the wider market. Now I will admit that I’m a little biased towards the Salt Lake Pops Orchestra, since its founder Nathaniel Drew is one of my best friends (like I said, this is not an objective process). Nevertheless, I wait with anticipation for the Salt Lake Pops’ various orchestral takes on pop music. And they are definitely gaining a following. Although a couple of their music videos haven’t impressed me as much as others. Their recent LOTR/Hobbit tribute is beautifully arranged musically by Nate (as is all his music), yet the video doesn’t have the same sheen of professionalism as Salt Lake Pops’ “Firework,” “Falling Slowly,” and “Grenade” music videos. Yet the work of Nate’s orchestrations and the musicians’ beautiful sound keeps me hooked and bringing on some major Mormon pop musical talent with names like David Osmond, Alex Boye, Jessie Funk, Aubree Oliverson and Lindsey Stirling hasn’t hurt either. The exceptionally talented and acrobatic violinist Lindsey Stirling has made a huge impact on You Tube this last year, especially with gamers and “geeks,” interestingly enough. Along with her original work, she has tapped into the most unlikely of music markets with arrangements of video game music from The Legend of Zelda, Skyrim, and Assassin’s Creed, as well as other “geek friendly” material like Lord of the Rings and A Game of Thrones. 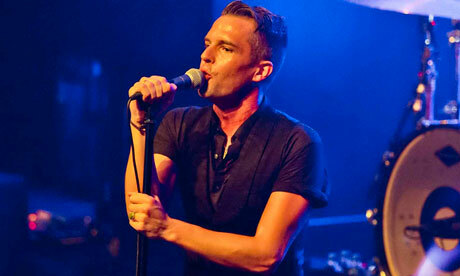 Stirling is currently on a concert tour with huge crowds all over the country. The fact that she has kept a pulse on pop culture in her music and capitalized on alternative, online outlets (or not so “alternative” anymore!) like You Tube has given her global following and made her a very visible Mormon artist. I’m just waiting for someone like her or the Salt Lake Pops to do some of my personal brand of geekiness… superheroes. Hanz Zimmer’s Batman/Dark Knight scores, anyone? Or maybe Nate can do a grouping of nineties cartoons music like X-Men, Batman: TAS, Animaniacs, and Gargoyles (okay, I just outed myself as a major nerd). I can thank a post by Theric Jepson here at A Motley Vision for putting some mainstream bands with Mormon members on my radar. Although I was already vaguely aware of Brandon Flowers from The Killers, Imagine Dragons were new to me (I’ve never been very savvy with keeping up on pop music), but now I’m definitely a fan… their music is playing pretty constantly around here now. It’s very fun to see some Mormons get some mainstream respect (even though there is some pretty lame backlash sometimes, like when a European talk show brought on Richard Dawkins to punk Brandon Flowers about Mormonism. Despite the insult during a segment that was supposed to be about their music, I thought Flowers handled himself as well as could have been expected considering the circumstances). Mormon comic book artist Mike Allred has been getting some good love this year over at Marvel Comics. As the creator of Madman, X-Statix, and a less known (at least among the mainstream comics industry) series of graphic novels about the Book of Mormon, Allred has already garnered a lot of respect in the comics industry, but now he has been entrusted with one of Marvel’s major titles in their new Marvel Now! initiative, FF. The premise of FF: the Fantastic Four are going into an alternate universe for what they think is going to be four minutes, but just in case something happens, they entrust another four heroes with their responsibilities over the Future Foundation (a group of exceptional, super powered kids), the Baxter Building, and the protection of the World. The title is already getting a lot of love from the comic book community, and Allred has a lot to do with that. Allred’s quirky, yet at times still surprisingly emotionally evocative style (that owes more than a little to Jack Kirby), is something I’m very attracted to. I also loved seeing him work on my personal favorite heroes the X-Men recently in an issue of Wolverine and the X-Men. I have thoroughly enjoyed Scott Hales’ literary criticism, reviews, interviews, etc. the past year here at A Motley Vision, as well at his various other online homes at Modern Mormon Men, the Association for Mormon Letter’s blog Dawning of a Brighter Day, and his blog The Low Tech World. His passion for Mormon literature is clearly evident as he has been very productive in his output and his viewpoint is always informed, fair, and yet bold. Even when I disagree with him on occasion (which is actually pretty rare), I always find his viewpoint to be well reasoned and defensible. He’ll speak his mind without getting offensive, but he also is not afraid to give pointed praise along with his pointed criticism, when he feels a work is deserving. He has interesting, searching ideas and articulates them beautifully. His breadth and depth of knowledge regarding Mormon literature is impressive. I think we’re very lucky to have Scott Hales spreading his valuable thoughts on Mormon Literature throughout the Bloggernaccle. I’ve followed Christian Vuissa‘s quiet, intimate films with a lot interest. He’s not showy nor overwrought with his work, but rather always approaches his subject matter with an elegant, intimate sensibility. When he approached the early years of Joseph Smith and Mormonism in Joseph Smith: The Plates of Gold, he brought these same wonderful qualities. Never dodging controversial aspects to this part of Joseph Smith’s life, like his folk magic and treasure digging, yet Christian never sensationalizes them either. Rather he recognizes them in the context of Joseph Smith’s more personal journey in the film. I left the theater quiet and thoughtful, recognizing that I had finally seen a full length film about Joseph Smith that I thoroughly loved (the second Work and the Glory would also fit this category, if Joseph Smith was the actual protagonist). This was a task that was actually quite difficult considering how many other attempts had delivered such a weak, watered down version of Church History that left me highly dissatisfied. The film still may not have searched as deeply as I would have liked, yet it was the perfect expression of the faith and personality I know Christian possesses–humble, quiet, wise, and good. I thought it was a beautiful film and it is a personal favorite of mine among Mormon Cinema. Is there any real surprise here? Even if they hadn’t published my plays, Zarahemla Books has been the most consistent source for quality Mormon literature the past several years. Fortunately we have publishers like B10 Mediaworx, Parables, and others who are making very valuable contributions to the Mormon Literature Market. Yet my personal favorite still remains Zarahemla, with their philosophy still focusing on the adventurous, even “edgy,” but ultimately faithful approach to Mormon Literature. That’s the kind of work that resonates with me personally. Terryl Givens is, well, a “given” for me now (roll eyes here). If his name is on it, my interest is piqued. As perhaps my favorite scholar on Mormonism, Givens always has such a articulate and refreshingly honest handle on the faith, never jumping into wholesale polemics, but also giving such a fresh, intelligent and persuasive voice to the believing Mormon perspective. So I’m easily lured into any Givens’ book. 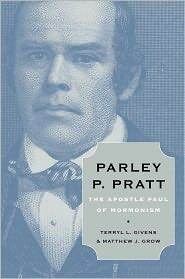 Not that, as a major Mormon history fan, I needed much convincing to buy a scholarly biography on the always fascinating Parley P. Pratt. As much as I loved Pratt’s original telling of his own story in his autobiography, I very much appreciated the extra focus and emphasis that the complicated events leading up to Pratt’s martyrdom got here, which we don’t get in Pratt’s original narrative, for obvious reasons. I’ve very much considered writing a play about that climactic and compelling end part of Pratt’s life and this biography gave me one more compelling reason to consider such a project. We will see. In the meantime, definitely give this book a read if you want an entrancing point of view on Mormon History. Given and Grow do tremendous work in this book. All right that’s what I enjoyed in 2012! What were your favorites? Fun stuff, thanks. The upcoming Greene play is “ADAM & STEVE AND THE EMPTY SEA”, not “open sea”. Pronounce “empty sea” and think about missionaries. I’ve also been mulling a Persuasion adaptation for years. But in my case, it would be a scifi novel in the vein of Heinlein’s Citizen of the Galaxy. So I don’t think Mel can be counted as having bested me to the finish line. Ooh, I loved Citizen of the Galaxy in middle school, I should try to find a copy and see how it holds up. I devoured all of the Heinlein juvenile books when I was young, then moved on to his adult books, which may have warped me in ways. You mean like CotG is based on (looking it up) Kipling’s Kim, your story would be a scifi version of Persuasion? Okay, you got my attention with that pitch, Th. More like Persuasion set in Heinlein’s universe. But I was planning on sticking extremely closely to the original text and now that Pride & Prejudice & Zombies has happened, I’m not sure it’s worth getting back to. The last thing I want is to be accused of ripping of that thing. Should have acted first. Lesson learned but left unapplied to my life. Oh, hey! I’m happy to be “favorite.” Thanks. Now I’ll read the rest. Awesome list overall. Love the artists, love the books/writers, love the music, will look into the theater stuff. 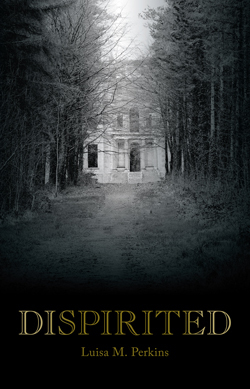 As Dispirited was one of my favourite novels of the year, I’m naturally intrigued by the rest of your list. Some of the entries have me bemoaning the fact that I live in Middle of Nowhere, Canada. Not much in the way of theatre up here, alas. I absolutely loved Jaclyn Hales’ performance in Rings of the Tree, and loved the play. I took my 16 year old daughter Alaina to see it and we both were caught up in the vision of it. We enjoyed Unicorn City as well, and I agree that Jaclyn shines in that movie. I really should make more of an effort to support mormon arts and letters because your list makes me aware of my lack of familiarity with artists and writers in the field. I wholeheartedly agree with your assessment of Christian Vuissa. He’s a great filmmaker and a good friend to boot. Not sure if you have seen his work but my neighbor Brian Kershisnik is an amazing painter. I highly recommend his artwork.